This e-learning course has been developed by the Clinical Safety Team at NHS Digital in partnership with Health Education England e-Learning for Healthcare. It is designed to support health and social care organisations and manufacturers of Health IT products with training in the principles of safety, risk management and risk mitigation, all within the context of Health IT by implementing the safety standards, DCB 0129 and DCB 0160. The safety standards provide a requirements framework that supports a systematic approach to clinical risk management during the development and use of Health IT systems. The standards establish the need for organisations to establish a clinical safety case to support the development and use of such systems. The ‘Community of Interest’ is an area where people can find knowledge and share good practice. This is aimed at individuals working within Health IT, this includes manufacturers and health organisations. The core course, ‘Clinical Risk Management Training’, comprises seven sessions and one assessment session. The second module, ’Community of Interest’, is an area where people can find knowledge and share good practice. In addition to these two modules, we have two ‘Best Practice Guidelines’ sessions that are designed for health and social care organisations. The e-learning is supplemented by a 1-day class based course which will provide the knowledge and tools to support compliance with the safety standards and empower clinical safety officers to sign off and approve safety documentation. Further details regarding our 1-day class based course can be found here. The course is designed for clinical and non-clinical staff who need to gain an understanding of the clinical risk management activities undertaken during the design and/or implementation of a Health IT system to support the implementation of DCB 0129 and 0160. This includes clinicians, managers, developers and testers. Healthcare provision and delivery within the NHS today is highly dependent on information technology, which provides sophisticated systems and services. Healthcare is an integrated and complex ‘system of systems’, with a patient’s care pathway being influenced by technology, different services, and the patient’s condition. Whilst the use of Health IT (HIT) delivers significant healthcare benefits, failure or unintended use of HIT systems undoubtedly has the potential to introduce hazards and associated patient harm. NHS Digital established a national safety management framework, which advocates a robust but light-touch approach, expending effort that is commensurate to the scale of risk. NHS Digital has written and published two safety standards, one for manufacturers (DCB 0129) and another for health and social care organisations (DCB 0160). Each standard establishes a methodical approach to clinical risk management. The standards follow the approach established in the medical devices domain and are broadly consistent with ISO 14971. This ensures a consistent approach to clinical risk management is embedded within NHS England. A key concept in DCB 0129 and DCB 0160 is the promotion of establishing and maintaining a safety culture and management framework. The risks associated with delivering complex care to larger client populations is increasing, as is the associated cost of indemnity and insurance. The NHS Digital clinical risk management system is proven to address these risks by developing a safety culture. If you already have an account with e-LfH, then you can enrol on to the Clinical Risk Management Training programme by logging in to the e-LfH Hub, selecting My Account > Enrolment and selecting the programme. You can then access the programme immediately in the My e-Learning section. 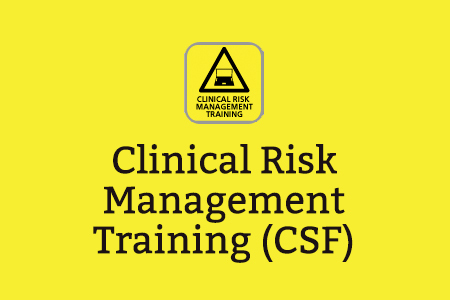 The Clinical Risk Management Training programme is also available to NHS healthcare staff via the Electronic Staff Record (ESR). Accessing this e-Learning via ESR means that your completions will transfer with you throughout your NHS career.